Some manufacturers started combining their IP Cameras with home security accessories. EyeSight has one with a price as low as 66€! The camera alone, ES-IP805AW , is sold for 65€! So for 1€ extra, the choice is obvious! Cloudlink P2P network transmission technology: automatically change the stream, suitable for various network environment. Smart card slot, remote view. Multi-Path Transmission (Patented Technology): where P2P can not connect directly, video and audio can use other P2P equipment as relays. 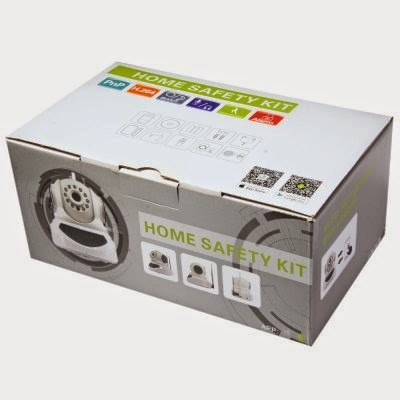 The kit contains one door sensor, with a 12v battery already inserted, and one PIR detector with its 3 AAA batteries also provided. 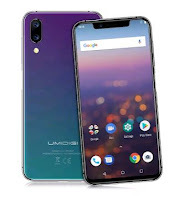 It can be also powered via its MicroUSB connector. To receive the signal from the detector, the telescopic HF antenna must be plugged into the Audio port of the camera. Also provided are: mounting accessories, power adapter, RJ45 cable and a user's manual. It became the trend for many p2p cameras to rely on a smart phone application rather than a web interface. It is not a bad thing especially when, like here, it provides a much better user experience than a web interface. 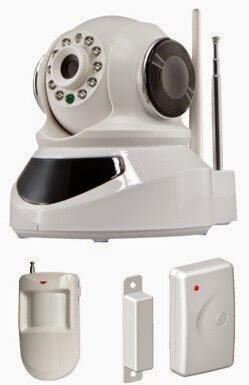 ES-IP805AW is managed by Phonescam which is identical and interchangeable with 2CU (used by the tiny ES-IP810W reviewed earlier) or V-Cam. 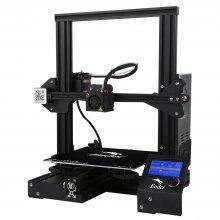 The setup process requires the registration of an account, which can be used thereafter for any additional camera of the same family. The next step is to register the camera itself. For this model, this can be done in 2 of the 4 ways presented. 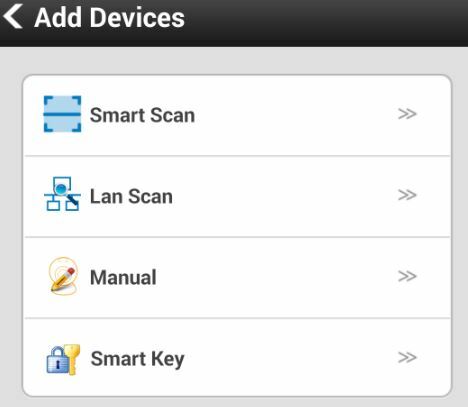 (a Smart key is not provided and it does not seem to support the Smart Scan, whereas the camera reads a QR code displayed on your smartphone screen). The best experience is obtained with the smartphone application. An ActiveX-based viewer can be used online at http://cloudlinks.cn/view, and a PC program is also available, but they're both quite dodgy. The camera can store its recording on a microSD memory. The captures can be viewed from the smartphone app. If taken straight from the memory card, GPlayer is required to read the proprietary video file format (.av) recorded. 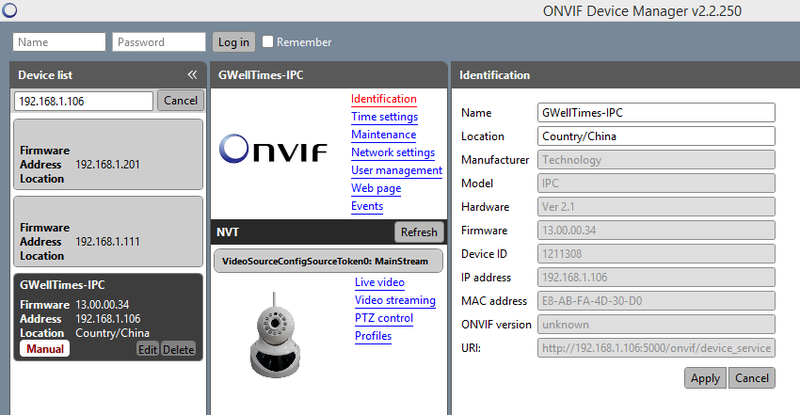 The port scanning reveals 2 services: 554 for rtsp and 5000 for upnp/ONVIF (again not compatible with Synology). These can be used with many 3rd party viewers. The HI3518 chipset in this camera is capable of 720P (1280*720) resolution. In reality, this is only effective in the mobile app's live view, if HD mode is selected. Videos and snapshots are always stored in 640x360. The streaming shows the same limitation although there must be a way to stream in HD since the app does it. 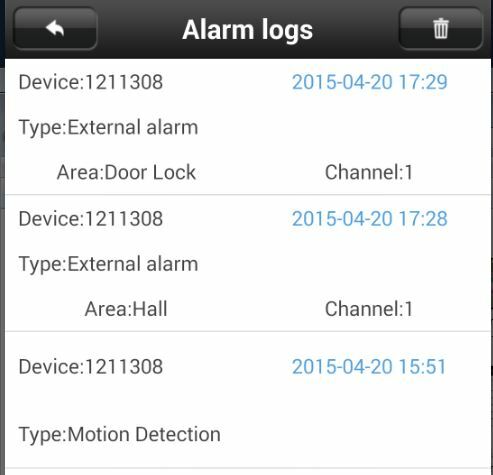 A PIR detector and a Door Sensor are provided in the box and need to be registered through the mobile application. 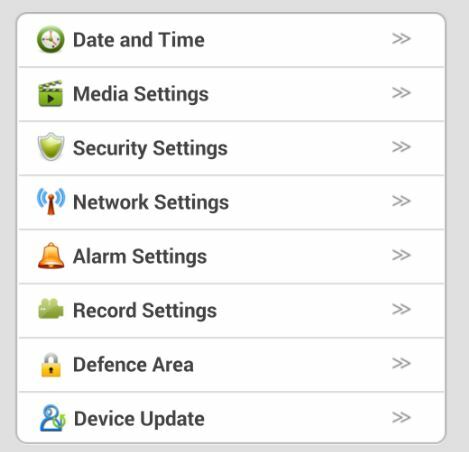 Once the camera has been registered, touching anywhere beside the preview thumbnail brings a mini-menu, select "Settings"
Then select Defense Area and choose a category of sensor to register. 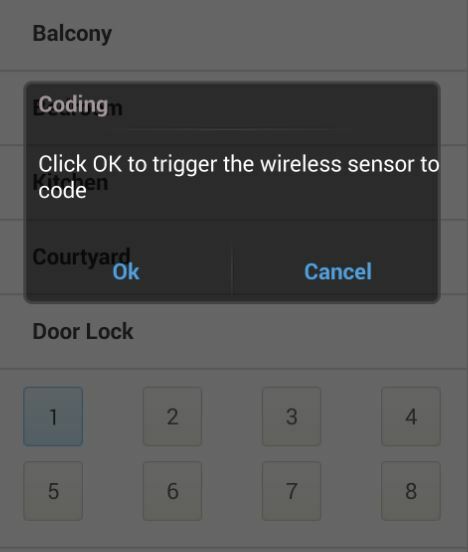 A prompt appears asking to press OK and then trigger the sensor. In the case of the door sensor, this means moving the magnets away from each other. For the PIR detector, just move in from of it. The app will confirm the "successful learning". 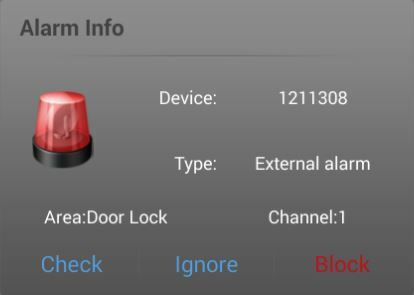 From that moment, the registered sensors will be reporting any detection event to the camera which will trigger an alarm accordingly with the indication of its origin on screen and in the Alarm logs. 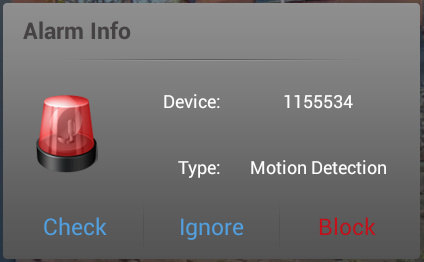 The motion detection can be set to sound a ringtone of your choice and/or send an email. If there are too many alerts on a short period of time, the program will itself limit the quantity of emails sent. 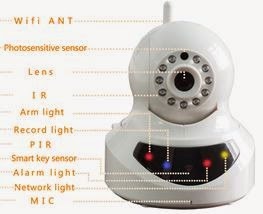 The camera can handle many sensors, including a remote control, but the EyeSight does not indicate where to get them. I tested one of my old DS10A (X10 Door Sensor) and it works, but the MS10A (X10 PIR Sensor) would not. 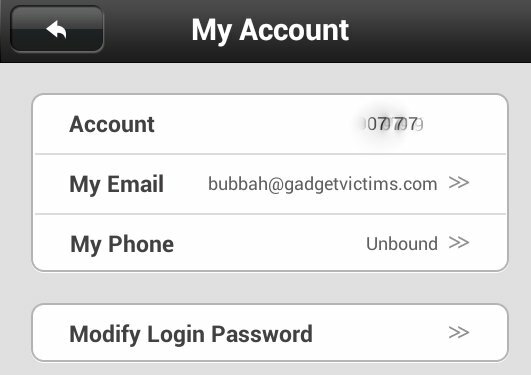 On-line update are done via the smartphone application for both the device and the app. It is a very straightforward and safe process. For 66€ at Gearbest, the ES-IP805AWKIT from EyeSight is a very affordable bundle for securing a place beyond the traditional visual detection. The complete and easy to use smartphone interface makes this camera kit an ideal choice for non-techies. - Neat Mobile app, clean and intuitive. - Poor documentation: Have to find out yourself how most features works. This is however balanced by the intuitive user interface.